A running toilet can strike a mild panic in any homeowner, worried that a repair may be soon to follow. 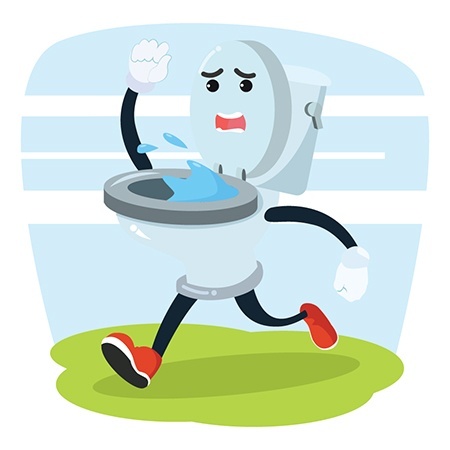 Chances are a running toilet can be easily fixed without making an emergency call to a plumber. Here you’ll find a few quick tips to stop that constant running of your toilet before it becomes a bigger problem. Check your tubes. Sometimes the fill tube can become loose or come out of the overflow tube. Checking the tubing makes sure the fill tube is fastened tightly to the valve and is placed inside the overflow tube. Along with the tubes, check your flapper. If the flapper isn’t closed, water will continuously leak into the bowl. The cause of this could be something obstructing the closure of the flapper or a chain that is too short to allow it to fully close. Adjust the fill height in the tank. If this height is set too high, it causes an overflow in the tank and creates that nonstop running noise. Adjust your levels until the noise goes away and make a note of the fill level mark. Replace old flappers and chains, and you’ll notice a world of difference. A universal model will be the best bet, and all that’s needed for the installation is a pair of pliers and the new pieces. Following any of these steps will save you from calling a local plumbing service. But just in case none of the above can fix your problem, set an appointment with a plumber as soon as possible to get to fixing your porcelain.